Nutritional Shakes, Plant-based Milks, Supplements, etc. In addition to an IP address, what additional parameters, if any, does a host need to get from the DHCP server? Discover broadcast –> Client requests an IP address. The client broadcasts a DHCPDISCOVER message on the physical subnet to find available servers. The client creates a UDP packet with the broadcast destination of 255.255.255.255 or the subnet broadcast address. Offer <– unicast DHCP server offers an IP address from its pool. When a DHCP server receives an IP lease request from a client, it extends an IP lease offer. This is done by reserving an IP address for the client and sending a DHCPOFFER message across the network to the client. This message contains the client’s MAC address, followed by the IP address that the server is offering, the subnet mask, the lease duration, and the IP address of the DHCP server making the offer. Request broadcast –> When the client PC receives an IP lease offer, it must tell all the other DHCP servers that it has accepted an offer. To do this, the client broadcasts a DHCPREQUEST message containing the IP address of the server that made the offer. When the other DHCP servers receive this message, they withdraw any offers that they might have made to the client. They then return the address that they had reserved for the client back to the pool of valid addresses that they can offer to another computer. Any number of DHCP servers can respond to an IP lease request, but the client can only accept one offer per network interface card. Acknowledge <– unicast When the DHCP server receives the DHCPREQUEST message from the client, the final phase of the configuration process is initiated. The acknowledgement phase involves sending a DHCPACK packet to the client. This packet includes the lease duration and any other configuration information that the client might have requested. At this point, the IP configuration process is complete. 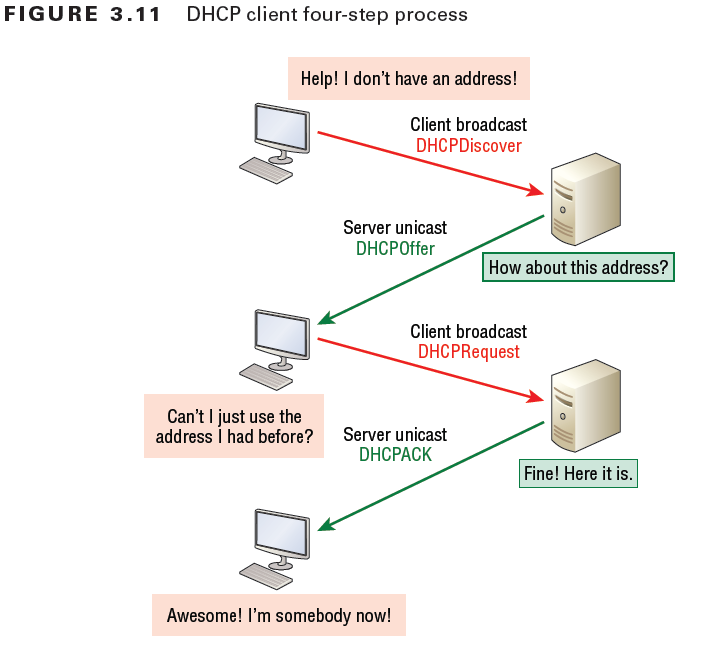 DHCP: How a client handles errors. DHCP Scope: A Dynamic Host Configuration Protocol (DHCP) scope is the consecutive range of possible IP addresses that the DHCP server can lease to clients on a subnet. Scopes typically define a single physical subnet on your network to which DHCP services are offered. Scopes are the primary way for the DHCP server to manage distribution and assignment of IP addresses and any related configuration parameters to DHCP clients on the network. Why is ARP on Layer 2 and not on Layer 3 of the OSI Reference Model? ARP does not provide Layer 3 services. ARP does not use Layer 3 services. If anyone claims that ARP is on Layer 3, ask them: Does ARP have an IP protocol number? Neighbor Discovery Protocol (NDP) performs functions for IPv6 similar to the way Address Resolution Protocol (ARP) and ICMP Router Discovery and Router Redirect protocols do for IPv4. A connection is first established between the sender and the receiver. At the end, the connection is released. TCP and SCTP are connection-oriented protocols. In a connectionless service, the packets are sent from one party to another with no need for connection establishment or connection release. The packets are not numbered; they may be delayed or lost or may arrive out of sequence. If the application layer program needs reliability, we use a reliable transport layer protocol by implementing flow and error control at the transport layer. On the Internet, there are three common transport layer protocols. Transmission Control Protocol (TCP) and Stream Control Transmission Protocol (SCTP) are connection-oriented and reliable. The first subnet obtained from subnetting has all bits in the subnet bit group set to zero (0). It is therefore called subnet zero. The last subnet obtained from subnetting has all bits in the subnet bit group set to one (1). It is therefore called the all-ones subnet. The IETF (Internet Engineering Task Force) discouraged the production use of these two subnets at one point due to possible confusion of having a network and subnet with the same address. The practice of avoiding subnet zero and the all-ones subnet was declared obsolete in 1995 by RFC 1878. In this class, we will always include subnet zero when we subnet. The Internet Control Message Protocol (ICMP) is one of the core protocols of the Internet Protocol Suite. ICMP works at the Network layer and is used by IP for many different services. ICMP is basically a management protocol and messaging service provider for IP. ICMP messages are encapsulated within IP datagrams. ICMP is used by network devices, like routers, to send error messages indicating, for example, that a requested service is not available or that a host or router could not be reached. If a router can’t send an IP datagram any further, it uses ICMP to send a message back to the sender, advising it of the situation. For example, take a look at Figure 3.17, which shows that interface E0 of the Lab_B router is down. ICMP can also be used to relay query messages. ICMP is assigned protocol number 1. ICMP differs from transport protocols such as TCP and UDP in that it is not typically used to exchange data between systems, nor is it regularly employed by end-user network applications (with the exception of some diagnostic tools like ping and traceroute). ICMP messages are divided into two broad categories: error-reporting messages and query messages. The error-reporting messages report problems that a router or a host (destination) may encounter when it processes an IP packet. The query messages, which occur in pairs, help a host or a network manager get specific information from a router or another host. For example, nodes can discover their neighbors. Also, hosts can discover and learn about routers on their network, and routers can help a node redirect its messages. When a packet is received by a router, what does the router have to do? The router will decrement TTL by 1, then evalutate the value of TTL to determine if the packet should be dropped or forwarded. What is the network that the packet is destined for? Do I have that network in my routing table? Which interface of mine do I have to send the packet out of to get it to the destination network? Forward the packet to the destination network via the next hop router. Until further notice, bring in a stand-alone calculator, with an Exponents (^key) Xy , (not the one on your phone, or computer) to every class.